Starring: Johnny Depp, Penelope Cruz, Geoffrey Rush, Kevin McNally and Ian McShane. 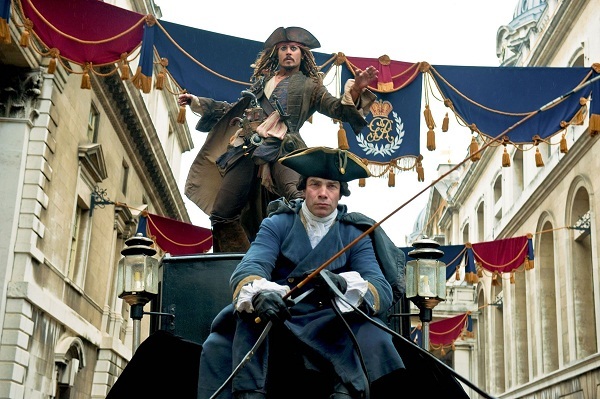 Captain Jack Sparrow (Johnny Depp) is back, and after avoiding a gaol sentence through his friend Gibbs (Kevin McNally), he's taken before King George II and asked about finding The Fountain of Youth. Sparrow has a map but the King wants him to work with Barbossa (Geoffrey Rush) in finding it before the Spanish do. Jack escapes and discovers that someone has been impersonating him. It turns out to be an old flame of his, Angelica (Penélope Cruz). She claims to be the daughter of Blackbeard (Ian McShane) and he and his crew are after the Fountain of Youth as well. Taken onboard their ship the Queen Anne's Revenge, Jack is forced under the tyranny of Blackbeard and his telekinetic powers to help with their expedition. Meanwhile, Barbossa is using Gibbs as a guide to locate the fountain first because he has a personal vendetta against Blackbeard. The fourth Pirates film is more serviceable than sunken treasure. Rob Marshall has taken the directing reigns over from Gore Verbinski for the first time. His film offers everything you've come to expect from the franchise and not a whole lot more. With each additional entry in a series it becomes increasingly difficult to develop the remaining characters in new and meaningful ways. This is why most trilogies die by their third feature. On Stranger Tides is a film of fleeting moments. It makes little effort to take its characters or audience to new places. And yet it's still occasionally rousing because of the slick handling of the set pieces and improbable acrobatic stunt work. There are some memorable ones here, most notably a shore side battle with some supernatural mermaids, throwing buccaneers into the air. And when Hans Zimmer's marvellous score begins to swell, it's difficult to resist. But at a ridiculous 135 minutes these action pieces are posturing as a narrative that doesn't make a whole lot of sense. This is a series that was adapted from a theme park ride after all, and it plays out in a similar fashion. That said there is far too much time is spent in a single location when they actually reach the island containing the fountain. But surely the most bizarre thread in the plot involves a marginalised missionary character and his relationship with a captured mermaid. It gives way to some highly transparent Christian-redemptive messages that don't fit with how comical the rest of the movie is. Finally, the film is capped off by a rather abrupt ending, which inevitably means that Pirates 5, 6, 7 and Son of Sparrow are on their way. Surprisingly, for a film of this budget there are some grating technical problems. The film is meticulously detailed, authentically visualising the period with lavish costumes and locations, but this is offset by some poor photography, with scenes that are badly lit and far too dark and muggy. It's a problem compounded by the useless 3D glasses, which are notorious for absorbing the light and colour out of any film. Save yourself the extra dollars and a headache and see the film in 2D because at this length the third dimension is more nauseating than dazzling. At least the most significant part of the Pirates formula is still intact. 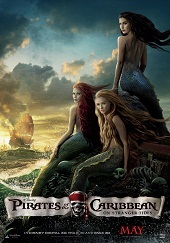 Captain Jack Sparrow is still one of the most enjoyable characters from films of this kind and Depp is in top form. The sporadically witty script provides him with some very funny dry humour. Towards the end of the film he tells Angelica: "If you had a sister and a dog...I'd choose the dog". Rush is a great sport again and is very charismatic as Barbossa, while Penélope Cruz has some nice chemistry with Depp, even though the back-story shared between their characters is underwritten. 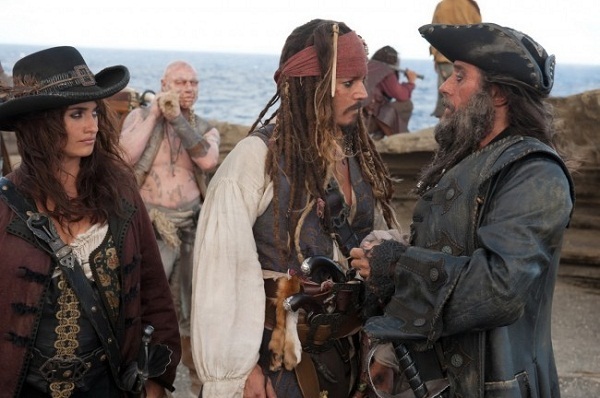 Ian McShane is also strong, providing some very menacing support as Blackbeard. Look out for Australian model and actress Gemma Ward too as a mermaid with some serious bite. This is a pretty safe entry that provides everything that younger fans have been expecting. The formula still works but it never reaches the heights of the first movie, which lived and breathed off its originality. Surely Disney realise that they're running out of air.